Ageing: Have we any choice? 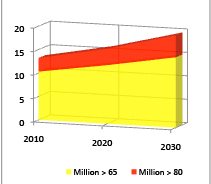 The UK is predicted to have almost 20 million people over the age of 65 in 2030. The proportion of older people relative to younger people is also increasing. People are living longer and, in general, birth rates are reducing. We have little choice in how we grow old. After the age of 50 the ageing process means that our mental and physical capacity decreases until death. The economic issues are are not going to disappear and however we play with the figures, the younger economically active people are faced with funding the growing ageing population. Chronic disease costs the NHS about £7 for every £10 it spends on patient care (College of Medicine). People age at different rates, and they have different needs. Whilst some are relatively healthy, an increasing number are suffering from chronic conditions. Health and lifestyle are closely related. The more active prefer to live independently as long as possible, the less healthy begin to need care assistance and may have little choice other than moving into care or nursing homes. Choice is important, but options reduce with with reducing physical and mental capacity. What is also clear is that the statutory services are reducing funding and that self-funding is going to increase after 2016. Many families will have no choice about funding of care in old age.